Recover digital images using the Comfy Photo Recovery program. The program recovers not only accidentally deleted photo files, but also images that were lost after formatting the hard drive, memory cards, or USB flash drive. The program's "Search for partitions" function lets you find and continue recovering digital images from the partition that was deleted. 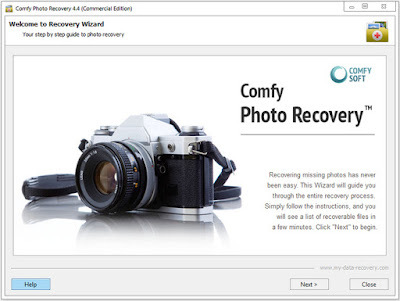 Comfy Photo Recovery is extremely simple to use, with an interface that was developed in the form of a step-by-step wizard that offers to fill in the parameters required for recovery. The program leads the user through the process of searching, recovering, and saving deleted photos. The only thing that will give you more pleasure than working with the program is the result of the photo recovery! -- Save them to a remote server using an FTP protocol.